Arsenic sword, with arsenide gold armor. I have to touch up the texture. It looks a bit too much like gold armor in which Steve had an "accident". Also adjusted the block colors a bit for arsenide bronze and arsenic. Recycle Your Arsenides will be done tomorrow. It's after 1AM, and I've started making mistakes. Right now, the recipes distil down to the ingots, not the large chunks. I will fix and re-post tomorrow. Yay! Use for bones and rotten flesh. Now to go find some slimes to kill. Am I the only one who upvoted this? Gaming is a gateway to a new world. "Recycle Your Arsenides" is now up. You can now recover some material from arsenide equipment, in the same manner as Simple Fusion Recycling and Recycle Your Silver. I was actually considering adding a Fusion recipe to make slime balls. I know long ago they were really rare, to the point some servers supposedly used them as currency. When I started playing, they were everywhere. Considering many of my pod farms are in reclaimed swamp land, I was constantly chasing them out of my potato patches, and pitched many slime balls into lava. After 1.6, it seems they are less common on the surface. Rotten Flesh and Bones can be gained from spawner-grinders. Slime balls may become rare again. Then again, you can smelt realgar into small arsenic chunks. I think so... But thank you! Well I haven't gone and looked for a swamp biome yet but have found a few in my mine. Maybe a recipe can use rotten flesh (since it would be slimy) and something from a swamp to make slime balls? Maybe? Oh, and I up voted just because it gives a use for all the rotten flesh I get. The plan was a block of leaves (so you would need shears) mixed with boiled cactus (cactus green dye), and zombie flesh as a catalyst. Well I don't want to change anything that you have planned but I had an idea. What if instead of making the slimeball, you made something that allowed you to spawn a fully grown slime? You could take a Rotten Flesh and a green dye, 1 clay as a catalyst (since clay looks somewhat rounded) and create a slime egg. Then you can use the egg to spawn the slime, kill it and possibly get more than 1 slimeball and EXP. Actually.... I could do a recipe pack with basic mobs to create spawn eggs. It would probably be the common ones. And, I would probably use chicken eggs as the base. Because that's also somewhat rounded. I would put that in a separate pack, though. Some people want to create spawners and spawn eggs (and there are many mods to prove it), but others do not want such things in their game. A monster egg recipe should not be mixed with anything else. I will be adding two Fusion Furnace recipes to the Arsenic mod, so I will make the slime ball a third. Thank you for the idea! I'll mention you in the description. Huh, thanks. Never thought some one would like my ideas. I never assume anyone will like mine. However, I put them out, and anyone who does is welcome to partake. I generally don't get large blocks of time to code, but I should be able to knock something like this out in a few days. My main concern is that the metadata on the spawn egg item works the same as for dyes. AleXndr changed the Fusion Furnace to base all input slots on an item stack rather than an item, which means the metadata is part of the information. (This is what lets the new version specifically accept lapis dust or bonemeal, rather than any dye.) I just have to see if the metadata info is restricted to a value of 0-15 (what is used by dyes, woods, colored baked clay, etc. ), or is an open integer (what is used for the damage value for an item, which is what spawn eggs use). Well I haven't gone and looked for a swamp biome yet but have found a few in my mine. A recipe for crafting slime balls has been added. Also, Old Lace Shrouds are infused with enough arsenic to make an excellent catalyst. Well, I do, but the code doesn't.. At least at the moment. Thanks to you, I found that the new Fusion Furnace code still as an issue with metadata in some stacks, and so a spawn egg recipe pack would be problematic at the moment. AleXnder has fixed the source, and plans to have the fix in the next Simple Ores update. After that, I have two small recipe packs started, and one will be the common spawn eggs, for those who want such a thing. Well better to find things out now than have issues with them later. Sorry about that, hehe. Now I see why people use image files for charts. Tabs are stripped, and extra spaces are stripped. In any case, the durability chart has been added to the Simple Arsenic description. If anyone has suggestions for how they should be tweaked, I will take suggestions into consideration. Keep in mind that arsenic is a fairly brittle metal. Arsenide Bronze has a slightly higher durability and enchantability than standard Bronze, but is otherwise quite similar. I would give the damage a little bit more since it can at least boosted by the bronze and gold. If there was a wider range of damage, I would, because I see the arsenic as doing poison damage. Otherwise, the damage only takes whole numbers, which means my options are 0 (regular gold, wood), 1 (stone, copper), 2 (iron, bronze), and 3 (diamond). I don't think the damage should be equal to diamond. It is equal to iron, which I think is good. Arsenide Gold is already much stronger than regular gold (+2 vs. +0). If I raise it to 3, it will be equal to diamond, and the intent was to make it a little better than bronze, and more enchantable. I will be using AleXndr's Netherrocks code as a template to add Poison to the arsenides. This will help with creepers and angry wolves, and will give it an advantage over regular bronze. I may make the arsenide bronze durability 440 instead of 420. That would be a bit more noticeable. Sorry, I didn't understand the table. Still new to the inner workings of mods and stuff, hehe. So, "Mining Level" must be an integer (whole number). That is how "hard" the tool is (pickaxe, but other tools are registered, so you can mine obsidian with an onyx hoe1). I think vanilla levels are 0 (cobble does not consistently drop from stone), 1 (makes iron drop), 2 (gold, redstone, diamond), 3 (obsidian). 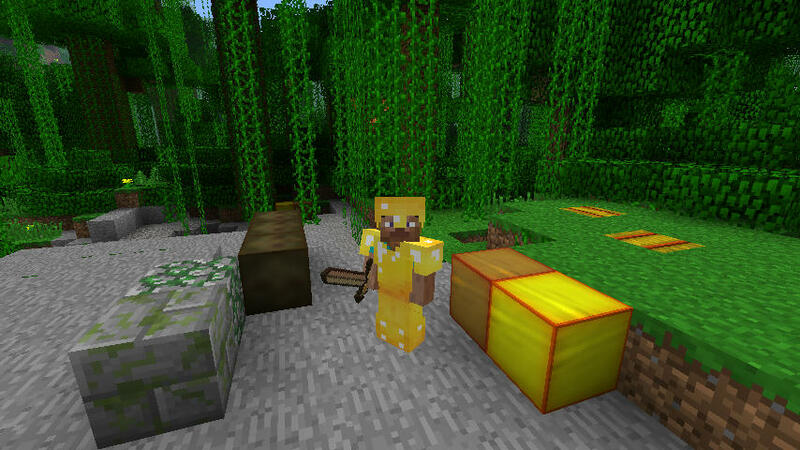 Mods have extended this, which is why Simple Ores materials go up to 5. I'm not sure how high this can go, but keeping it low simplifies things. Uses is the number of uses for the tools. Armor has a different way to determine how much damage it absorbs, which I don't quite understand. Repairing on the Anvil restores 25% of the max value per ingot added. (So, yes, it can take four ingots to fully repair a shovel, that cost one ingot to make. Replacement is usually better, unless you have an enchantment you love.) It must be an integer, but can go into the thousands. Mining speed is the multiplier for how fast the pickaxe breaks a rock. The durability of a block works against this, and there is a penalty if you are not using a pickaxe, to determine how long it takes to break that block stone or mythril ore or obsidian. It is "floating point" (has a decimal), but I've only seen values of x.0 or x.5, I'm sure for simplicity. Damage is how many half-hearts is added to your base attack value. One damage point is half a heart. It must be an integer. While visually in the game, one point shows as half a heart, it is 1 damage value. Defense, like Damage, is whole integers in the game, but 1 point is represented by a half-armor on the display. So, an arsenide bronze helm puts 1.5 armor icons on your defense, but in the code, it is 3 points. 1 This used to be popular. While the damage was not good, somewhere around late 1.4, early 1.5, it was found that attacking with a hoe did not cost durability points. Normally, using a tool for the wrong job doubles the durability cost. This made a diamond hoe a good weapon against common mobs. I haven't tried it recently, but my Silk Touch shears are still in pristine shape. If you use them to dig grassy dirt blocks or ice, there is / was not durability cost.